We had connected the Burgundy Cote D’Or Wine Loop ride with a ride along the Burgundy Canal. Both started and ended in Dijon, which is easily accessed by rail. The Burgundy Canal is one of France’s various well known canals, that existed in the past for commercial purposes. It was begun under the rule of Louis XVI and took 67 years to complete. Some still fill that purpose; but, mostly are used for pleasure. The full length of the canal has 209 ecluses or locks that are manually operated and some still have the old lock keeper houses with an actual lock keeper. Most have tow paths beside that vary from paved and well maintained to rough dirt and gravel. 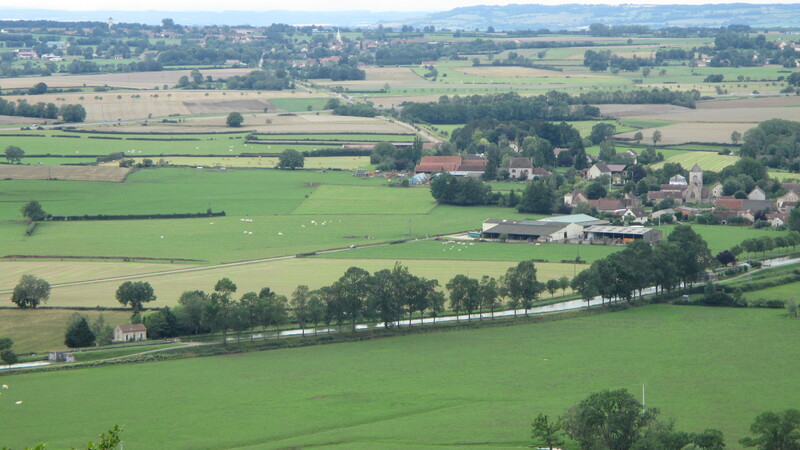 The quality of the Burgundy Canal varies and is best as it nears Dijon. 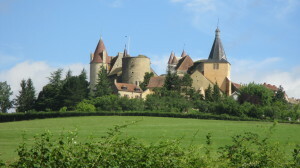 We began our ride just outside the town of Pouilly. 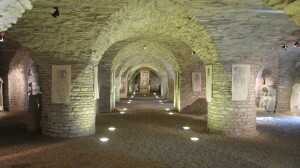 This has a nice tourist information and also has one of the ancient canal boats on display. It was a popular gathering point for cyclists. The canal narrows here and the path beside it here is paved. 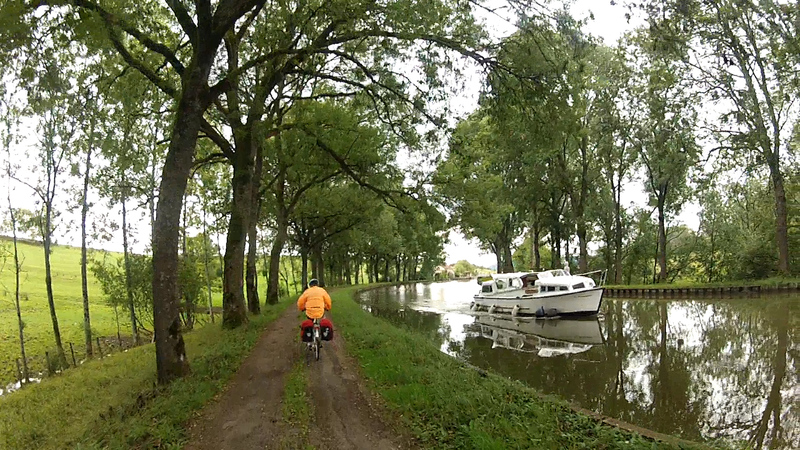 We head out and ride next to the canal on a tree lined path. 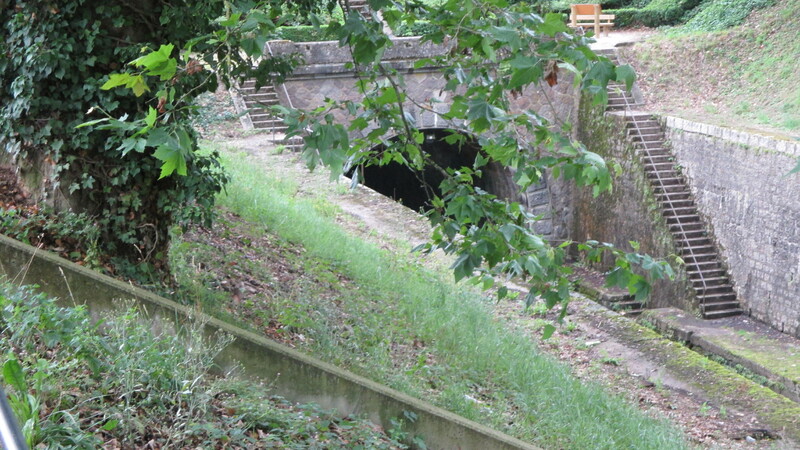 About 1.3km from the start, we see the opening of the tunnel. The canal runs through and under part of the town of Pouilly. The path continues above this mound, between rows of trees and we skirt through town and continue. The path parallels the roadway below. We go through the highway roundabout at about 4.4km and then back on the path. The canal is on our right; but, out of sight. Just after 6.2km we are back alongside the canal. Within just a short stretch, there is ecluse after ecluse. Some are not much; but, some are well maintained by their lockkeepers. 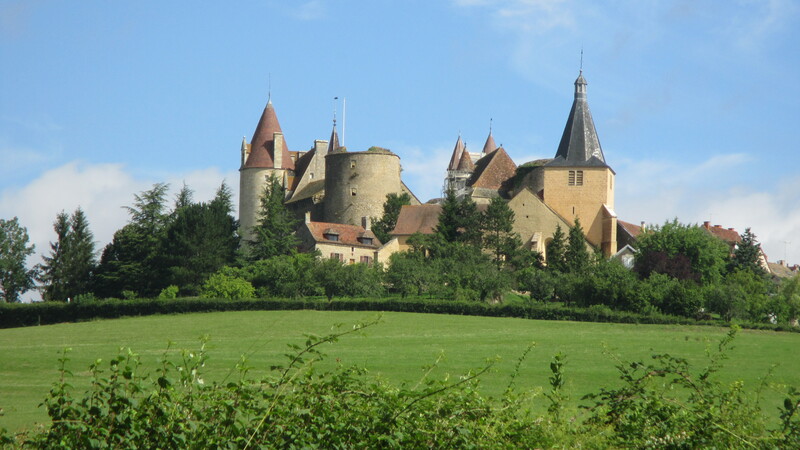 After about 10.5km we pass a field of grazing sheep and glimpse the Chateau on the hill. This is our destination for today; up and up the hill. 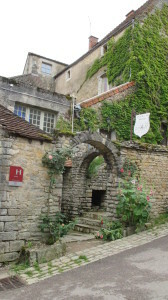 We turn off left, away from the canal at about 11km and make our way up to the ancient walled town of Châteauneuf-en-Auxois. 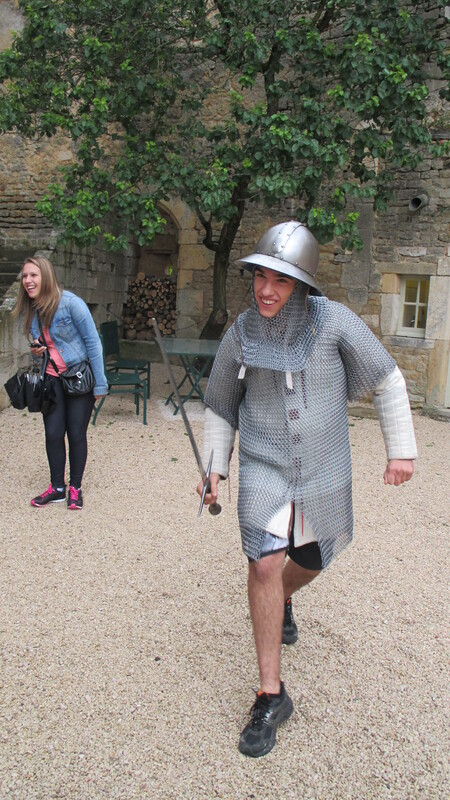 The castle, itself, dates to the 12th century; has a colorful history, and is well worth the tour. When we visited, tourists could try on the armor and heft a sword, before entering the castle for a self guided tour. We then strolled through this ancient walled town that grew up around the chateau and took in the fantastic views down over the valley below to the canal. There is something very special about staying overnight in such a medieval town. The majority of tourists leave before nightfall and you are free to explore and take in the beauty and solitude. 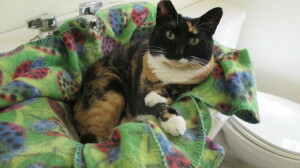 After many days that included at least a shower, today dawned with beautiful sunshine. A good sign. We had a wonderful sleep at the B & B and after a delicious breakfast, we were ready for the ride to Dijon. 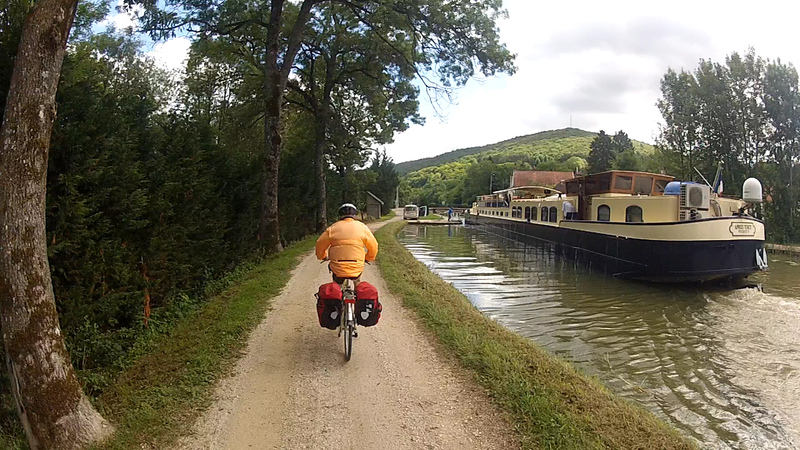 We wound our way through town and down the switchbacks to reach the Canal de Bourgogne on the D18A. We make the left turn onto the dirt path with the canal on our right. It is very rural on this side of the canal. We can see that there is a roadway on the opposite side of the canal and just up the hill. 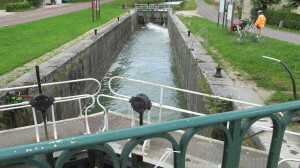 Soon we are passing more of the iconic old locks (ecluses). We did notice that most all the lockkeepers buildings were actually on the opposite side of the canal, where they could be easily reached by car for the lockkeepers. The path looks more like an old farm road with two tire tracks and grass growing down the middle. There is ecluse after ecluse and sometimes a small village around the ecluse, such as La Bussiere sur Ouche, St Victor sur Ouche, St Marie Sur Ouiche; but, generally, just the ecluse and small lockkeepers building. Once we reach the small town of Pont de Pany at 29.5km from our start today, and the ecluse here, there is a striking difference in the quality of the path. It is paved! Along the way, there are a few welcome picnic areas. With the paving, there are more cyclists on the path, as well. We pass by the pretty village of Fleurey sur Ouche, where the lockkeeper’s house is on our side of the canal. We start to notice more vessels on the canal, at this point as well and it increases, the closer we get to Dijon. 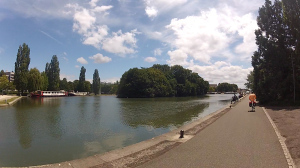 We pass by Velars sur Ouche and Plombieres les Dijon and shortly after passing under an auto bridge, there is a nice lakeside park at 46k. We pass us a stop and keep on toward Dijon. There are several other bridges to pass under on the trail after about 47k the path widens and we negotiate a roundabout and are then on the other side of the canal. This is a great approach to Dijon. There is a nice park with benches, pedestrians, more cyclists and an abundance of vessels in this basin beside the canal. At about 49k, we take the ramp from the path, up to the busy D974, where we cross, turn left and ride the path right into central Dijon. At 49.8k we reach and cross below a rail bridge and immediately turn left up the ramp to the tracks and then follow signs to the station. We are staying nearby. 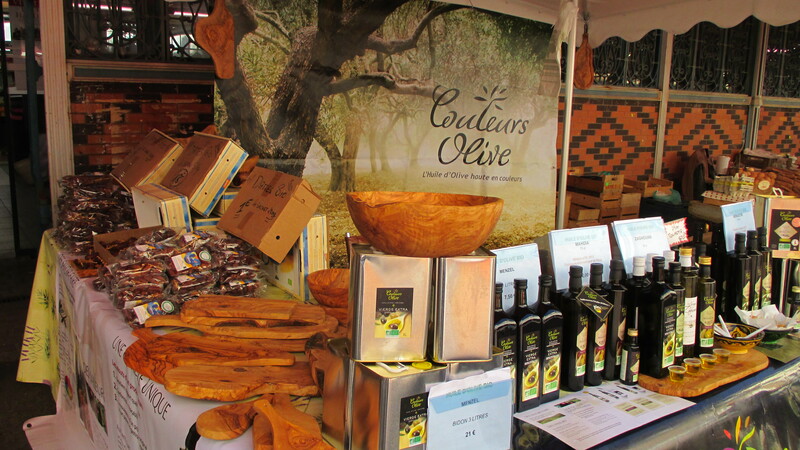 A trip to Dijon is not complete without some sightseeing and perhaps some mustard tasting. We investigated the market hall that was designed by Gustave Eiffel and the surrounding area of interesting shops and restaurants, as well as touring the archeological museum and relaxing in the park.